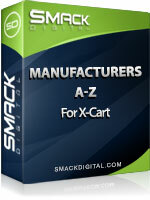 The Back in Stock module is a must have for any X-cart store. It provides the retailer with the ability to follow up on record and follow up on potentially lost sales and what's more it has the ability to fully automate the process. We have been running it on our site for years and could not imagine launching a site without it. Just in time for the Holidays! Our delivery date estimator will help solve customer confusion and give them clear shipping delivery dates! Easily set the categories you want to promote. Install this module with ease to set up your most prominent categories for sale. The most exciting module out there! Speed up your site and optimize for SEO all in the same module! Also works with CDSEO! Want to enable people to be able to shop on your website via their internet phones? Then this mod is for you! Allow customers to print your whole online catalog! Rather than printing just one product or one category at a time! See details xCMS - Blogs, Information, News, Articles and more! xCMS for X-Cart is a fully integrated, full featured content management system that allows you to post blogs, information, news, articles and more to x-cart. Add a "Remember Me" checkbox to your store as part of the Member Login box. When checked, the person's login information is remembered, and upon returning to the store at a later date, they are logged in automatically and their previous cart contents are remembered. This mod creates breadcrumbs to a product using the path the user navigated. The mod is SEO friendly a problem that plagues the default xcart breadcrumbs. Manufacturer paths are also created to a product, a feature not present in xcart.